In real estate, the relationship between a potential client and realtor is one built on trust, communication, and impressions. Providing amenities is a great way to show off your taste and personality, and private luxury transportation for your prospective buyers is at the top of the list in terms of ‘wow’ factor! SLO Safe Ride has taken this experience to the next level by providing showing tours in one of our ‘Landjet’ Mercedes Sprinters. The Landjet gets its name because it is essentially Air Force One on wheels. 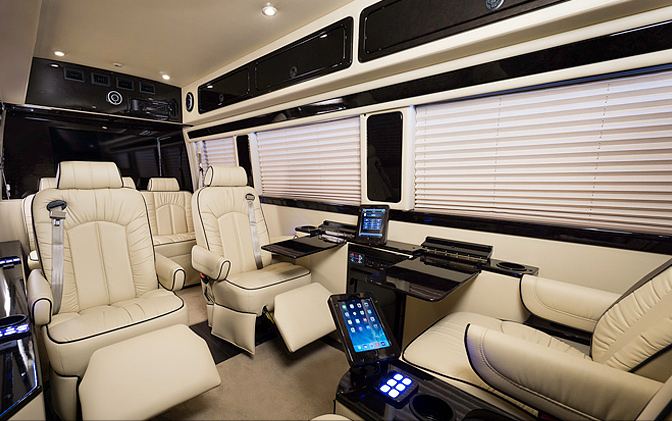 Its features include La Z Boy recliner seats, computers and work stations, satellite TV and radio, a closet, a bed, a wine fridge, and much more. It is truly a spectacle to behold, and even better to enjoy as a passenger! With seven seats in the rear compartment including four that face each other, it acts as a perfect mobile office to go along with its impressive comfort and elegance. According to the real estate site Trulia.com, transportation is one of the most impressive extras in selling luxury homes and commercial real estate. “Supplying transportation for potential buyers is not only the professional way of doing business but it offers the agent an opportunity to get to know their customer better. This knowledge base can be helpful and lead to information that could lead to a sale.”1 It is easy to see how the LandJet would be perfect for this dynamic. Additionally, in a competitive real estate market like San Luis Obispo and the Central Coast, going the extra mile (both literally and figuratively!) is often economical for both parties despite the cost of hiring professional transportation. “We have too little time to communicate with them as it is. This is an excellent venue and opportunity to learn what we need to know. Interestingly, most showings I have done have been at least 3 people (sometimes 4) so they take up a whole car themselves.”2 Landjet Tours start at $135 an hour, but that is easily worth it when looking to maximize your face time and selling points for high profile listings.